I can not believe the prices, and from what I hear they are a good target load. Is it true that? I mean $52 for 500 147 gr bullets shipped is really cheap. Is this a scam? are these bullets any good? and Is there anything comparable? BTW tried my first batch of 50 this weekend with Speers. All my concerns have gone away with reloading. I like SNS Casting. Their 147s are $38/500 ($46.45 with shipping and taxes) and there is a 5% discount code floating around. I've had no issues at all with them and I've been through a few thousand in the past few years. Last edited by reverser; 04-14-2019 at 11:07 AM..
Lol those are red, anyone make white ones? Haven't considered that yet! I cast and powder coat my own in red, white AND blue . All for .06/round for 9mm ready to shoot. 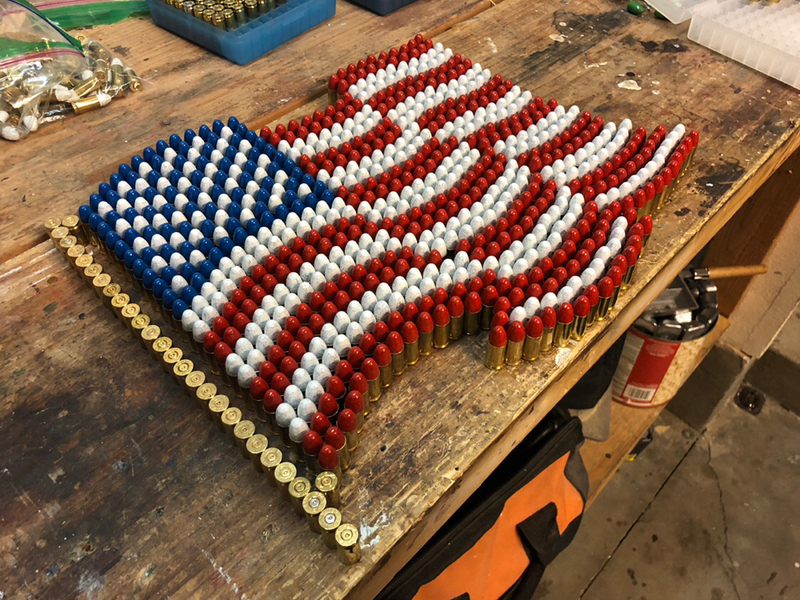 Last edited by EMR; 04-15-2019 at 9:54 AM..
Eggleston Munitions had red, white and blue combo packs for last years 4th of July sale. They are going through an ownership change..... phoooey. Not taking orders at the moment. ACME in bulk..big bulk...like 6000 to 12000 bulk. Anyone in OC wanna do a group buy? Been buying from Everglades for years. Good prices, fast delivery. Eggleston 147 grain and 124 grain won't chamber in my CZs. There is something about the shape that keeps the cartridge from going all the way in. 115 grain works, though. [QUOTE=EMR;22899291]I cast and powder coat my own in red, white AND blue . All for .02/round for 9mm ready to shoot. 2 cents per round? Maybe my math is fuzzy. Is that just for the coating? The lead bullet? If you don't mind shooting jacketed bullets Rocky Mountain Reloading sells their FMJ 147gr Heavy Matchwinners for about the same price...including Priority shipping. If you buy 1k, it's only $90. Badman sells their 147 powder coated 9mm for $98/1K if you buy 2K, $101 per 1K if you only want a thousand. Quality is top notch and shipping is free on any thing over a thousand. I buy there bulk boxes. 3900 115RN for 234 shipped with a promo code. Good friends will come bail you out of jail. A best friend will be sitting next to you in the cell saying damn that was fun! 78 bucks for a 1000 bullets. I've not used their 9mm, but I shoot their .30 cal 165 RNFP in low power .30-30 loads and like them just fine. Hi-Tek, not powder coat if that matters to you. Calguns.net, where everyone responding to your post is a Navy Force Delta Recon 6 Sniperator. Blue Bullets work great for target practice and competition. If you buy in bulk, they are cheaper. $225 for 3000 147gr RN in 9mm. That comes out to $75. That's with free shipping. 115 gr bullets are cheaper. Use coupon code TRIANGLE for 5% off. Berry's Bullets (plated)are $78.22 for 1000ct at powdervalleyinc. But you have to add shipping to that powdervalley order. If you make a good target load for a certain bullet, then buy in bulk to save more money. I have been buying X-Treme's plated 124gr FP 9mm for years... I usually buy during Black Friday deals. I think $68/1000 shipped, as I seem to have plugged into my spreadsheet for the last purchase 11/2016 w/vet discount. Right now you can get 3000 124gr FP plated for $296.37 including shipping (~$0.098/ea), w/no sale. Looks like, w/out shipping you are paying about $0.104/per. For 2000 including shipping, 124gr FP plated are about the same price you are paying. Excellent collection of leads. Tagging. The powder coating replaces the lube traditionally used on bare lead. Last edited by EMR; 04-15-2019 at 5:55 AM..
You guys never read Catch-22? I use ACME. Many of my buddies load Blue. Basically it comes down to what color you want your rounds to be. Yep, one of my favorites. Brazo Bullets are by far the cheapest. The 9mm 125gr RN are 5 cents per bullet. Quite a few guys on the Enos forum have tried them and report back nothing but positives for them. DG Bullets are a close second. I ordered a sample pack and then later a case of the 9mm 135gr RN bullets. Very consistent weight and dimension. Very accurate. 3.2gr of tightgroup at a OAL of 1.13 shoots very accurately out of my SP-01 and makes 130 PF. Use code TS15 and get 15% off. Gets you to just over 6 cents per bullet. Last edited by anonymouscuban; 04-15-2019 at 3:45 PM.. When you see a good deal on components, jump on it and your cost per round will go down. Will the red or blue coated bullet leave any lead deposit in side comp on open pistol? The powder coating is supposed to prevent leading entirely. Powder coating is supposed to prevent leading entirely. Much better than total metal jacket or they are equally the same? Usually lead is fine under 1000 fps. Depends on the firearm too. Yea, I didn't NEED any reloading components but, I went to preview a collection that was up for sale with a couple friends. We were the first to be allowed to go through it. Since I didn't need anything, I only took $1000, plus whatever I had in my wallet, in cash with me. I came home with empty pockets and wishing I had taken $5000 with me. Hopefully Badman Bullets won't mind if I quote their website... here's what they say about powder coated (personally I call it a toss up between plated and powder coated. Jacketed it another bird altogether.) eta: The part about barrel wear...I don't know about that. "What are the advantages of shooting Polymer Coated Bullets? * Badman Polymer Coated Bullets have a strong lead core (16 BHN) with a durable 2 layer baked on Polymer coating finish. They perform extremely well from low to high velocities. We have personally tested our .452 diameter 250 Grain RNFP bullet to 1,800 fps with great results. Compared to plated or jacketed bullets they are less expensive, as good as or better and they don't foul your barrel." Last edited by Sputnik; 04-16-2019 at 6:46 PM..
so plated bullet is different from jacket? I thought plated bullet is total metal jacket. Plated have a thin electroplate vs a true copper jacket. Some plated are thinner than others. Plated have velocity limits.